Keto Almond flour biscuits are tender, fluffy, and wonderful with sweet butter. They are low carb, gluten free, and ready in just 20 minutes! These keto almond flour biscuits are amazing. They are tender and fluffy, and they smell so good when they bake! I always loved biscuits. When I started eating a low-carb and grain-free diet, I thought at first that I would have to give them up. To my relief, I soon discovered almond flour biscuits! Do almond flour biscuits taste like regular biscuits? No. As always when I recommend a gluten-free baked good, I would like to set your expectations straight. 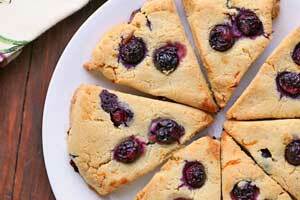 Lacking starch and gluten, almond flour biscuits are not the same as wheat flour biscuits. They do not rise as much, and they are not as fluffy and tender. What ingredients do you use in almond flour biscuits? I make these keto biscuits with sour cream. I saw many recipes that use butter, and I’m sure that would be fine. But I think that sour cream makes biscuits extra tender, and adds a wonderfully distinct flavor. I’m sure you could replace the sour cream with full-fat plain Greek yogurt if you wish. Although I suspect sour cream is better. Don’t try to shape these keto biscuits by hand. The dough is too sticky for that. Rather, treat them as drop biscuits and use a scoop to drop them on the baking sheet. 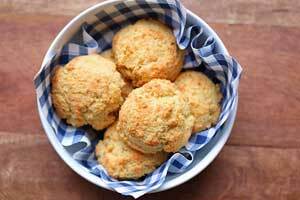 How to serve almond flour biscuits? I usually make them for breakfast. They are great on their own, or with any number of spreads. Such as butter, low carb jam, almond butter and keto chocolate hazelnut spread. Another great variation that I often make for dinner and serve with chili is this recipe for gluten-free cheese biscuits. Are these almond flour biscuits healthy? I think they are! They are certainly a big improvement over high carb white flour biscuits. Almonds are, as you know, very healthy. And almond flour is basically almonds. Two of these biscuits have 280 calories, 5g net carbs and 10g protein. They also contain 50% of your daily vitamin A and manganese requirements, and 20% – 30% of riboflavin, magnesium, phosphorus, copper and calcium. These almond flour biscuits are best when warm. If you have leftovers, keep them in an airtight container in the fridge on paper towels for up to 3 days. Briefly reheat them in the microwave before enjoying. You can also freeze them in freezer bags. I almost never have leftovers, because I tend to make just 6 biscuits at a time, but you can easily double the recipe. Almond flour biscuits are tender, fluffy, and wonderful with sweet butter. They are low carb, gluten free, and ready in just 20 minutes! In a medium bowl, whisk together the egg, sour cream and salt. Using a rubber spatula, mix in the almond flour, then the baking powder. Using a 2-tablespoon scoop, place 6 mounds of the dough on the prepared baking sheet. Do not flatten the mounds. Bake until golden, 15-18 minutes. Serve warm.